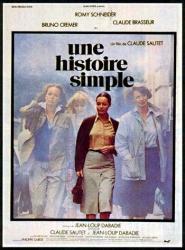 Drama, France/West Germany, 1978, 110 min. Synopsis A simple story about simple people. A 38 old divorced woman (Marie), who now has a lover (Serge) but decides to leave him, abort his baby, and then returns with her ex-husband (Georges). Their daily life and of their friends, who have the same typical problems.